Great news, folks: the National Weather Service is predicting 4-8 inches of "heavy, wet snowfall" from Wednesday evening into Thursday morning -- or, the exact time that all of us are trying to get the hell out of this city at the same time. AP reported that flights had already been canceled as early as Monday night and that some airlines have waived rebooking fees to encourage passengers with tickets to travel to certain cities on Wednesday to fly Tuesday or Thursday instead. 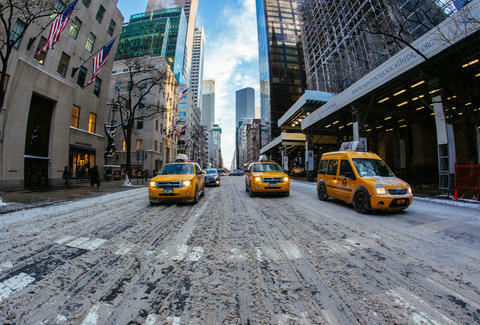 AccuWeather Chief Meteorologist Elliot Abrams says that the worst time to travel in the Northeast will be on Wednesday. The best time to travel will be Tuesday, with the next best time on Thanksgiving Day. According to Storm Team 4 at NBC New York, the roads will get sloppier the further inland travelers head. Parts of New Jersey and the Hudson Valley could see up to 10 inches. The City will most likely see a slushy coating. But have no fear, the storm should pass in time for the Macy's Thanksgiving Day Parade to go off without a hitch. Stay safe on the roads everyone, and try to stay sane at the airport. Take deep breaths, and think of turkey. Emily Kolars is an Editorial Assistant at Thrillist. As her great-Grandma once said: “If the duck walks in snow on Thanksgiving, it’ll walk in mud on Christmas.” For more crazy Minnesota sayings, follow her on Twitter.